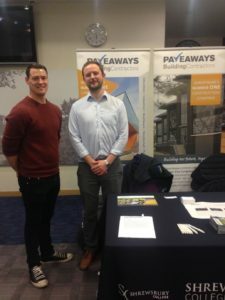 Quantity Surveyor Ben Jones and carpentry apprentice Carl Jones were on hand at the ‘All About Apprenticeships’ event at Shrewsbury Town Football Club on February 5 to talk to students about careers in construction. There was a high level of interest in all construction related careers and Carl was able to give first hand advice on his experience in the industry. We have some terrific opportunities for anyone interested in work experience or an apprenticeship with us. For further information please email steve.taylor@paveaways.co.uk.